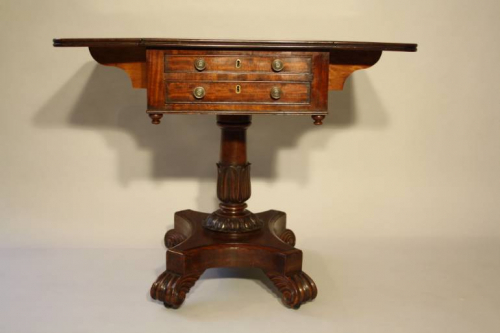 A very elegant William IV mahogany work box table with two drawers to front and two dummy drawers at back. Beautifully carved central pedestal with scroll and palm detail. The whole table is easily moveable on casters. Drawer locks stamped R.L. & Co. A versatile piece of furniture. When the table top is folded 49cm wide.